To be honest, I didn’t think they would. Even if the sight of golden fries covered in white and dark chocolate doesn’t look or sound all that appetizing, these were not too bad. 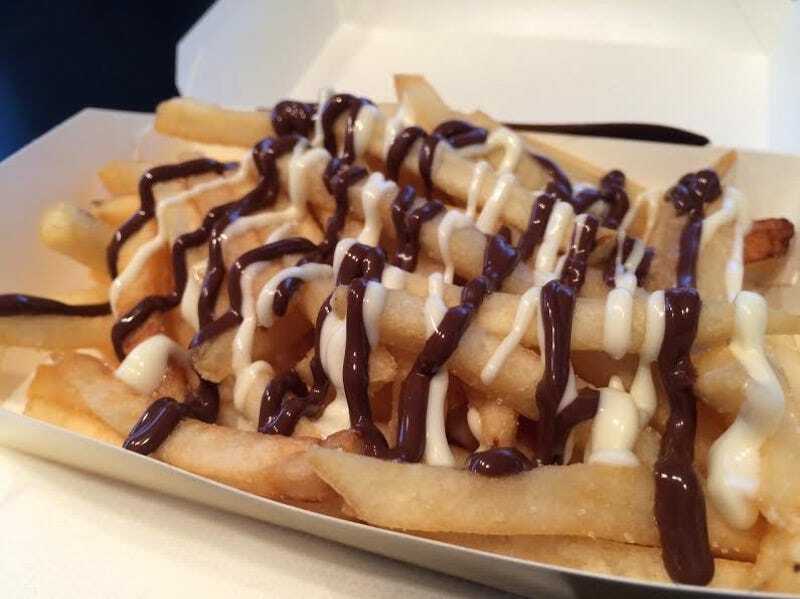 They’re a medium order of fries but with two kinds of chocolate sauce. The chocolate fries are priced at 330 yen ($2.79), while a normal order of medium fries is 270 yen ($2.28). That makes for some very expensive chocolate sauce. The white sauce tastes more sugary, while the other is more a milk chocolate. Going into this, I didn’t have much trepidation. Several potato chip brands in Japan have released chocolate covered chips in the past, and I’ve liked them fine. The salt makes for a fine balance with the chocolate’s sweetness. The same is true here. Salt and chocolate complement each other quite well. Since the fries are served hot, when you squirt on the sauce, the warm fries heat up the sauce. This causes the chocolate smell to become even stronger and noticeable. But since McDonald’s fries have a strong smell of their own, if you are sensitive to certain scents, you might want to sit this one out. As with chocolate covered potato chips, chocolate covered fries are greasy. French fries by themselves are greasy, so you might think that adding chocolate sauce would make this side dish seem heavy, but there isn’t actually that much sauce. So by the time you get to the end of your chocolate fries, you might wish McDonald’s had included a bigger package of chocolate sauce.